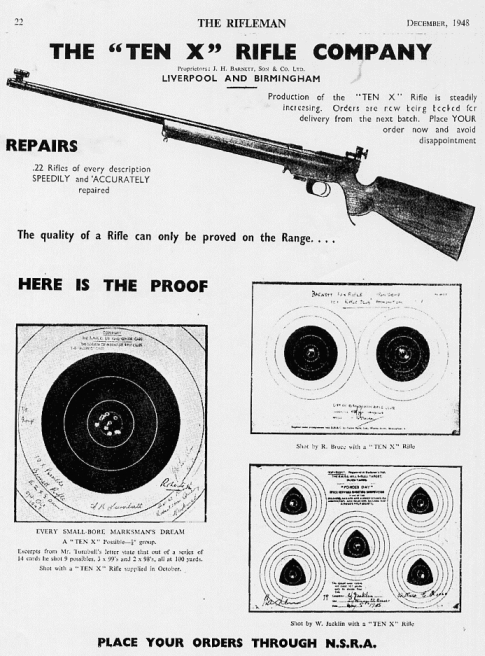 The Ten-X Rifle Company is not to be confused with either the Ten-X Manufacturing Company of Iowa, U.S.A., or the Ten-X ammunition developed and marketed by Imperial Chemical Industries ( I.C.I) and their subsidiary Eley. This is a vintage, 1930's to World War Two, size 42 US ARMY / 10X SHOOTING JACKET! This was made by a commercial company, the 10-X Manufacturing Company of Des Moines, Iowa, to GOVERNMENT SPECIFICATIONS of ARMY TWILL!!! This does NOT have a QM tag, but it has the original maker's tag with all of the pertinent information! This is a size 42. This has age and wear, it was dry cleaned in the 1950's or so and still has their paper tag - and a message saying that they could not get all the stains out. This does have wear and stains. This has age and use, and this was issued /used by at least one man. (IRWIN or CALAC?) More about that in a minute. This is the 10X shooting jacket. This is a tan khaki cotton twill with the natural leather pads on the elbows and on the shoulder and on the left bicep for the Hasty sling. This pre-dates the US Army's HBT OD shooting jacket of WW2 and the 1950's. (Okay,they probably overlapped in WWII.) By the 1950's the 10-X Company had newer tags in their coats, and they also used black rubber elbow pads! THIS HAS NATURAL COLORED / TAN LEATHER PADS ALL AROUND! "IMPERIAL 10-X, BY 10-X MFG. CO., DES MOINES, REEVES ARMY TWILL, MADE TO GOV'T SPECIFICATIONS, DRY CLEAN ONLY, 42." Underneath the tag is an old faded name, inked in, to "CAJAC." On the back of the jacket are the outlines w letters used to be sewn on for "IRWIN." T was Camp Irwin before it became Fort Irwin, California, in the Mojave Desert. (It was an AntiAircraft ACK ACK Testing Range in WW2!) This might have been used by a sharpshooter named CAJAC who was on the Camp Irwin / Ft. Irwin shooting team. As for the size 42? I laid it out flat, all buttoned up, and it was 22 inches across at the widest point, at the armpits. It was 26 1/2 inches from the top of the collar to the bottom of the skirt. The waist, at center button, is 21 inches across. It is 18 inches across the top of the back from shoulder seam to shoulder seam. It is 24 inches from the shoulder seam down to the cuff. This seems to be truly a size 42 or 42R or 42 Reg. If you are a size 44 this willl be too tight on you. A size 40 or 42 might be PERFECT! Now, these are made to button on you rather snug / tight. You want the jacket to help steady your rifle / sling, and a baggy shooting coat does not help you. The elbow pads are a big help if you are lying prone. The recoil pad on the right shoulder will really help you if your M1903 Springfield kicks you! The pad on the left arm is so you can really snug down your leather HASTY SLING to add one more contact point to steady your rifle! If you plan to wear this, please measure your own uniform that fits you, and that way you can compare sizes. This is a great old uniform, from right before WW2, in overall very good condition.
. The Opening bid is 99 cents. Please ask any questions before you bid, I want you to be happy with this, and all sales are final. Thank you to our veterans!